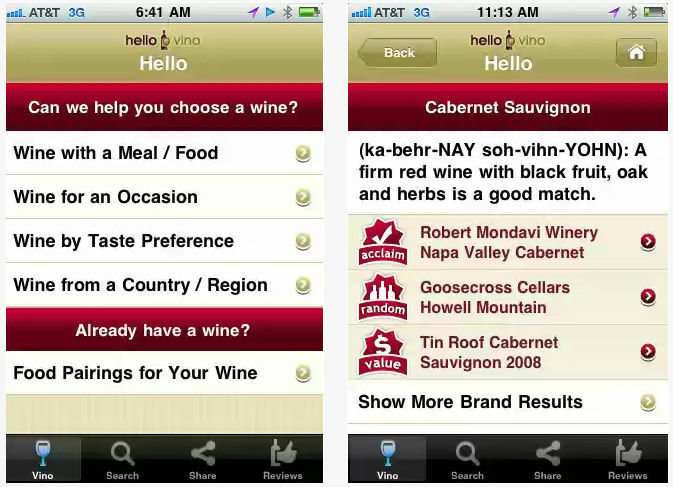 Ranked #1 on “Apps for Wine Lovers” (Mashable.com) – Hello Vino will help you in the wine aisle – the free app gives you wine recommendations for meals, occasions, holidays, and by taste preference. “If you want to impress your date, pull up Hello Vino to make it look like you know whether to order a Zinfandel or a Malbec.” – NPR Morning Edition, Apps for Foodies to Drool Over. With thousands of wine recommendations, pairings, and gift choices, Hello Vino is the most comprehensive wine app available. 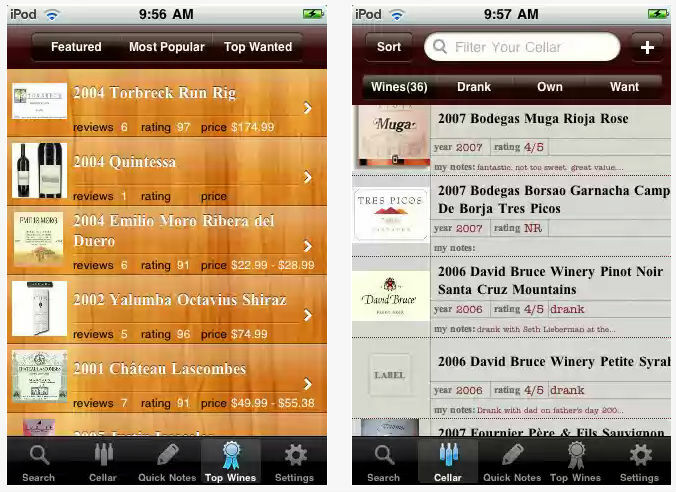 The free app also provides wine brand recommendations with tasting notes, ratings, and label photos! 2. Clinks By Clinks, Inc.
Do you scan the wall of wine at your local grocery story, not sure if you’ve had a particular bottle before? Have you enjoyed a recent wine tasting event, but not remembered the name of that great tasting wine you tried earlier in the day? Could you tell your friendly wine store clerk about a great wine you had last weekend? Do you want to know what wines your friends like to drink, as a better source of recommendations? Clinks is a tasting journal for wine enthusiasts that’s been crafted for utility, speed, and delight. With Clinks, you can keep track of the wines you taste and like, share your recommendations with your friends, and discover what you and your friends really enjoy. Remember What you Drink – Find just about any wine instantly, log a tasting note, rate it, snap a photo of the label, and save it to your Drync Virtual Cellar for future reference. Research Wine – Whether at a store or restaurant, use Drync as you would a top sommelier. Find the wine, read expert reviews, ratings, and see current market prices. Make more informed wine buying decisions and learn about the wines you drink with Drync’s extensive database of wine information, community tasting notes, and expert reviews. Selected by the New York Times, Mashable, Macworld, and others as the top app for wine, Drync puts over 1 million wines in your pocket. Ever wonder how many calories or carbohydrates are in your favorite alcoholic beverages? Not anymore! 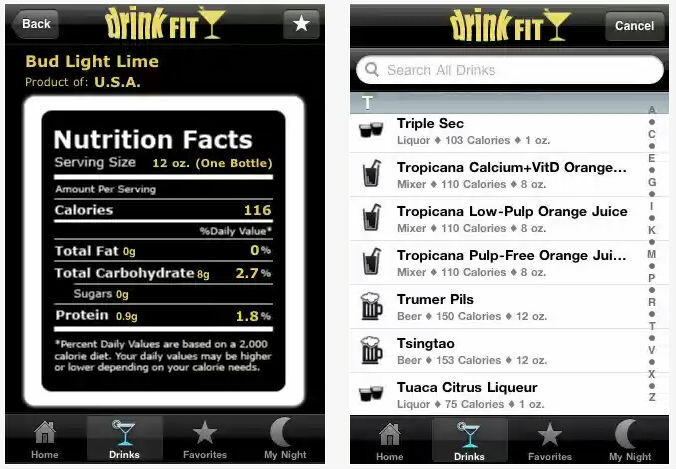 DrinkFit provides nutritional information for Beer, Cocktails, Liquor, Wine Coolers, Wine & Mixers. Maybe you’ve been at a restaurant and wondered what types of wine had the least amount of carbs… With DrinkFit, these problems are solved! Curious which light beer has the fewest calories? Want to know which cocktails to avoid? Looking for a healthy mixer? The power is now at your fingertips! If you are becoming a wine connoisseur, then you are expected to know the terminology. This is where the Wine Glossary app comes in. 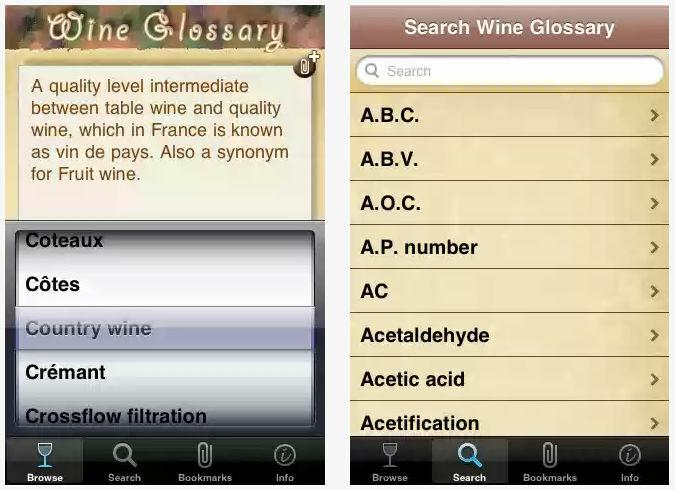 We have over 450 wine-related terms in this app that ranges from ABC (Anything but Chardonnay/Cabernet) to Zymology. You may have heard these terms when chatting with vineyard owners or at wine tasting sessions. This application will help increase your knowledge in wine tasting… GUARANTEED! 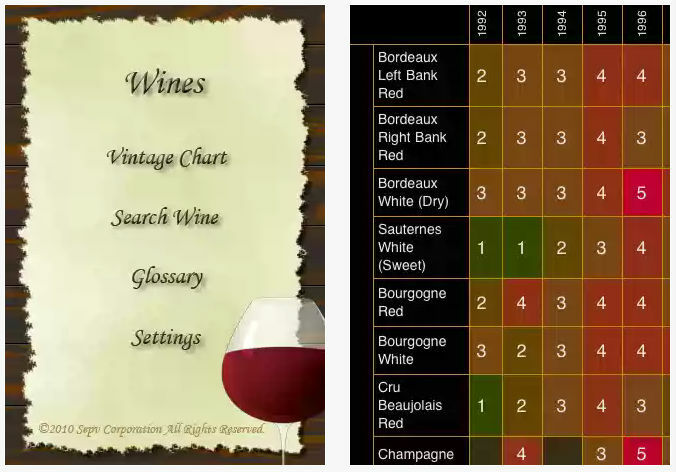 The ‘Wines’ comprises “Vintage Chart”, “Wine Glossary” and “Wine Search” functions. When you choose or buy a wine, It is a useful application for answering questions such as how good or bad of a Bordeaux wine (of a particular vintage year), the name of artist who drew Château mouton (of a particular year), the meaning of wine glossary such as “bouchonne”, and also the details of different brands of wine. Pair It! 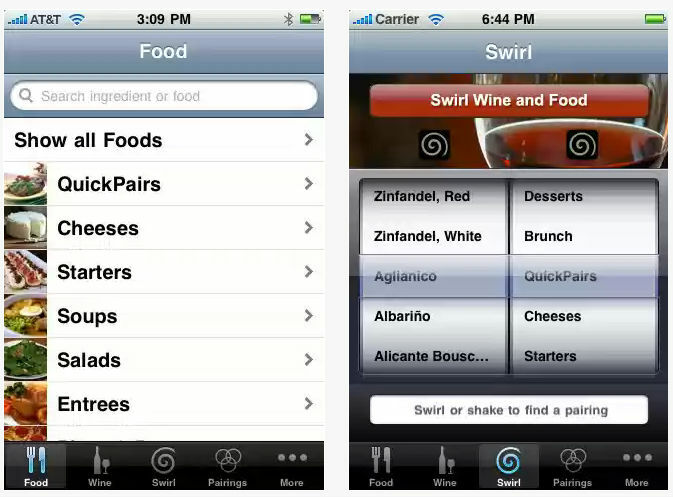 is a FRESH new way to match food with wine, and vice versa. Simply search Pair It! by wine, food, or ingredient for expert pairing suggestions you’ll find nowhere else. Can’t decide what to have? 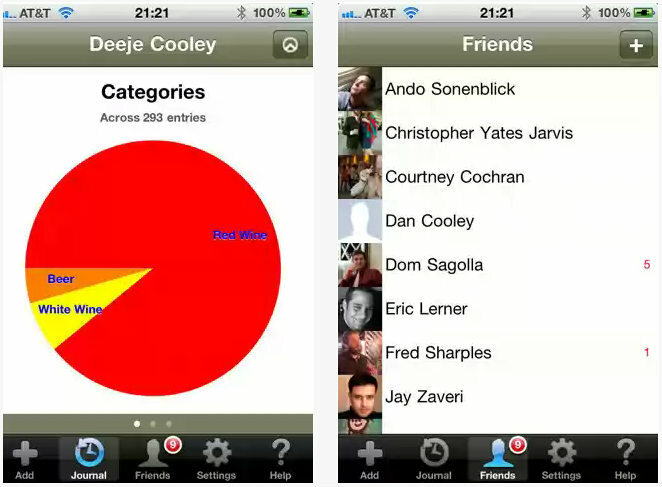 Shake or “Swirl” your iPhone for a different pairing every time. Pair It! has over 20,000 unique and easy-to-follow pairing suggestions, recipes, and tips. The app was created by renowned wine pairing expert, chef and educator Bruce Riezenman from the Sonoma County Wine Country. With over 750 cheeses, this is clearly the best pocket guide to cheeses made throughout the world. A “must have” for all connoisseurs of fine foods. Each cheese entry features artistically presented cheese photos, historically narrated flavor descriptions, and suggested best choices for complementary wines. 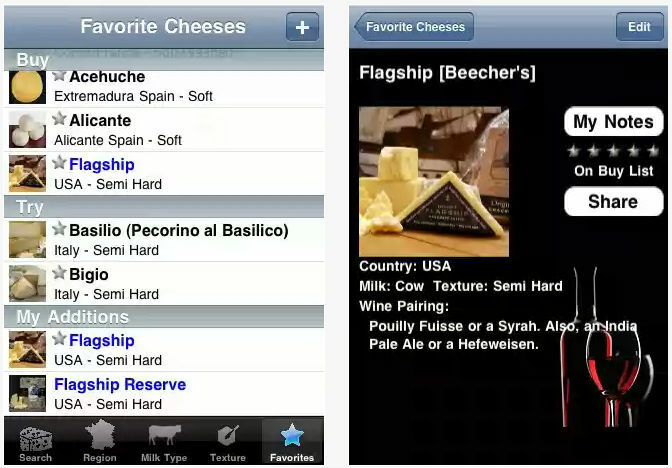 You can add your own cheeses to the standard library and attach personal notes about any of the cheeses. If you’re a classically trained chef, professional party planner, cheese buyer, or just plain cheese lover, grab Fromage, your favorite wine, and experience the wonderful and historic flavors of cheese. Now a universal app for both the iPhone and iPad… and it supports the French, Spanish, and German languages ! !